This 3DLucite ® features two clear Lucite pieces elevated 1 1/2” from the wall creating a multi-dimensional floating effect. 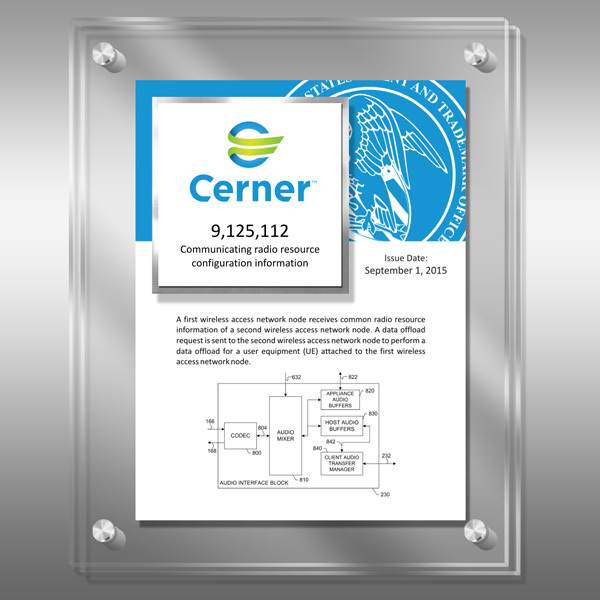 The Full Color HD Plate is mounted on a 3/16" clear Lucite ® plaque on the bottom layer and accented with Euro-style metal caps and stand-offs. Square 5" x 5" White HD Plate with silver accents is placed on the front layer and can be customized to any logo or image. Colors can be changed or made to match any logo. 9" x 12" and 5" x 5"
Cap Diameter: 5/8" Length: 1 1/2"
This Patent Plaque - 3DLucite® HD Color 3D2-W15 is part of our Modern HQ Series of products, check out other products & options available in the Modern HQ Series of our selection. This Patent Plaque - 3DLucite® HD Color 3D2-W15 can be modified to your requirements and is available for your corporate award programs.